The Bionic Woman comes to Oscar Goldman’s rescue … on a lunchbox! But nostalgia is also tricky. Things become compressed over time, and we tell ourselves that the ‘80s were a purely awesome decade for popular music, forgetting that for every LL Cool J, there were five Color Me Badds. 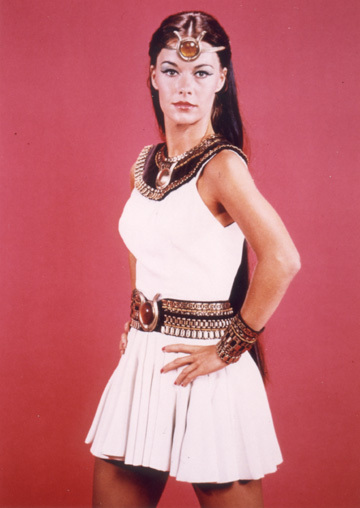 JoAnna Cameron portrayed Isis in the ’70s, and she was DOPE. Because I was a young, geeky girl in the mid-to-late 1970s, I’ve always been tempted to declare that this time period represented the BEST YEARS EVER for my demographic. I am certain that my younger friends could say the same thing about the ‘80s and the ‘90s, but, well, this is my blog post. Just to make sure I wasn’t imagining things, I looked up the dates of three female-led, superheroine shows that defined my early childhood. 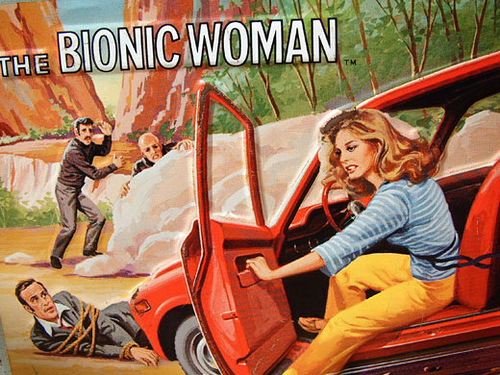 The Bionic Woman: Season One recently debuted on DVD, and you know what? I don’t even care if my adult brain perceives it as cheesy or hopelessly dated. I’m buying it. Why? Because Jaime Sommers, along with Mighty Isis and Wonder Woman, showed a generation of young girls that a woman could save the world. So I’m going to go ahead and declare 1975 to 1979 the BEST YEARS EVER for geeky girls. Note to Lindsay Wagner: If I happen to see you at a comics/sci-fi convention, I’d like to apologize in advance for my inability to speak coherently. You’re just that awesome. JoAnna was dope! And fine, let’s not forget that. While not at all looking Egyptian (to me), I always dug her on that show. It was fun fodder for Saturday mornings. And I think it came on after Shazam, right? Wasn’t she, though? I’ve never done cosplay, but I might have to work out that Isis situation for Megacon. And I think you’re right about the show’s proximity to Shazam! Good times, man. Good times. Loved all of those shows in my halcyon days! And I would mos def get DVDs of them as it would be a lovely trip down Saturday morning and Friday night lane. You are right about that lack of strong viable female heros these days, the last good one was Buffy who loved and KILLED vamps but now todays girls have Bella who just sits around waiting to be saved and drools over how pretty, sparkley and tattooy her suitors are. What up with that!!?? Over the holiday break, I watched some episodes of the Bionic Woman with my kids. They LOVED it. Sure, the special effects are prehistoric, but they were into it. It’s great to see a female hero leaping over the bad guys.